How on earth is it the end of August? Labor Day is just around the corner, but I still have so much summer to get in! We haven’t gone to the beach, or made s’mores, or even gone to the Hollywood Bowl. And I need to get in several more hours being lazy in the hammock. I feel like I’m turning into one of those old people who is constantly exclaiming about how fast time passes, but it does. This summer has passed in the blink of an eye. When I was a child, the summers stretched into infinity. I don’t know if it was that each summer was a greater proportion of my life, or if it was just that I had more time to slow down, visit the library, stretch out on the grass with a book, and let time stop. The Nuni is in that childhood stretch of time passing slowly, and she so badly wants it to charge on, full speed ahead. In the past few weeks, the Nuni (who will turn four in less than a month) has adopted a new persona, and has told anyone who will listen that her name is Polish (as in making silver shine, not as in Pope John Paul II), and she is seven. Those two things are intertwined. Of course, it is moments like this that make me want to stop time, to preserve forever the moment when my daughter is on the cusp of childhood, and nothing sounds better than being seven. I can’t stop time, but I can preserve the summer just a little, and capture some of my childhood summers at the same time. When I was a little girl, I would spend some of those infinite summers with my great grandmother, eating berries out of her garden, getting into her cookie jar (I can still remember where it was kept), and eating her homemade tomato jam. 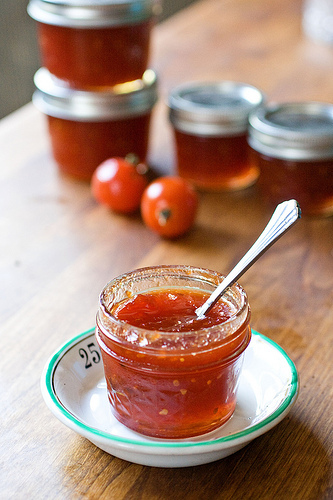 Not a chutney, or another version of ketchup, the way so many tomato preserves recipes are, but a tomato jam, brightened with lemon, with that musky tomato flavor and the pure sweetness of preserved summer. 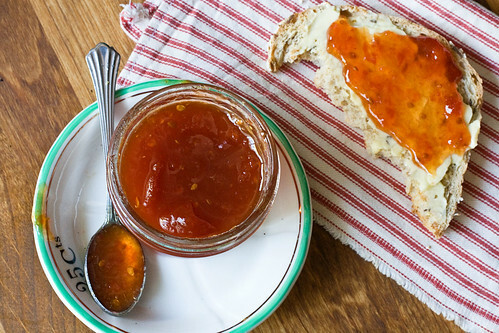 Perfect on toast, for that lazy summer breakfast, this really is summer in a jar. 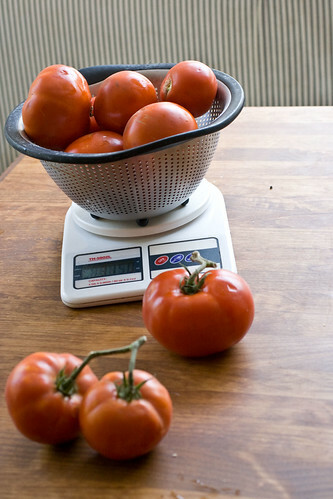 Using a sharp knife, score the bottoms of each tomato in a cross, then plunge the tomato into boiling water for about 20 seconds. Remove and let cool, and when cool enough to handle, peel and roughly chop the tomatoes over a large pot, to catch the juices. (This is not a neat process. You might want to wear an apron.) 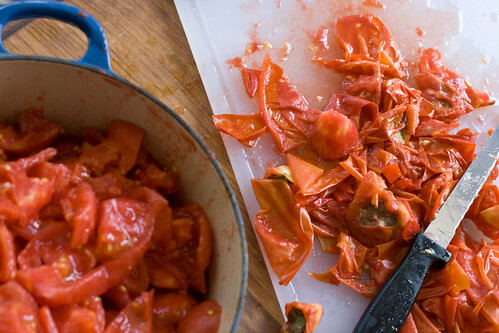 Discard the skins, and place the tomato chunks into the pot. Add the lemon juice to the pot, and add the lemon halves to the pot with the tomatoes. Heat the tomatoes over medium heat. Add the sugar, 1 cup at a time, stirring after each addition, and waiting about 10 minutes in between each addition. Lightly crush the tomatoes, or use a hand blender to puree slightly, and let cook over medium heat, stirring frequently, until the jam begins to jell and the entire mixture is bubbling like a swamp, being careful not to let it burn. Remove the lemon halves. Ladle into hot canning jars with new lids, and process in a boiling water bath for 10 minutes. With all the tomatoes I have, this will be a perfect way to use them before they spoil. Haven’t used tomato jam for a while, thanks for the post. What a great post–funny and full of little gems. And now I’m curious about tomato jam, which I had never given a thought before. Stacey — I think ginger would be a great addition. is the amount of sugar correct for this?? 4.5 pounds?? The ratio of 1: 1 fruit to sugar is a pretty standard one in jam making. You can reduce this if you add commercial low sugar pectin. Thanks Kate, I just added another 4.5 pounds of sugar. I have doubled the recipe. Hello I am looking at your recipe for Tomatoe Preserves. I am wanting to know can you use a sugar sub. for it instead of real sugar ,like Splenda Blend? I am a type 2 diabetic and I loved these while growing up as a kid and I would love to make some for myself and my family . Please respond to my e-mail and let me know please .Thank You . put in Subject line Tomatoe Preserve . will not check spam folder . Hi Tammy – it takes quite some time – probably at least 30 minutes, sometimes more like 60 or more. A bigger batch will take longer to thicken. Are you keeping some cold water to test the stage or using a thermometer? Remember, it will thicken more as it cools, but it should be forming bubbles that have some whomp to them. I have been making tomato jam for several years, and I do use pectin (powdered) when I make mine. I had one person who swore it was not tomato jam, but raspberry! Soo tasty. Can you tell me if this is actually sweet like a fruity jam? My kids don’t really like fresh tomatoes but they will often be open-minded about eating veggies in new things, as long as they don’t taste too veggie-like! The concept of tomato jam … I don’t know what to think of it! If you made a peanut butter and jam sandwich with this, would most kids eat it? Thanks! Thank you so much for posting this. I have lost my grandmother’s tomato-lemon jam recipe and have been frantically looking for a similar one for two years! I’ll have to make it to be sure, because when we visited in the summer, we would can dozens of pints at a time. Grandma had both an electric stove and a wood stove, and both would be fired up for all the canning we did. I can remember going outside when it was 95 degrees and feeling cooler than in the house. Of all the things we canned, the tomato-lemon jam was my favorite.